Virtual reality is a realm of innovation, and an area of gaming that feels increasingly fresh. 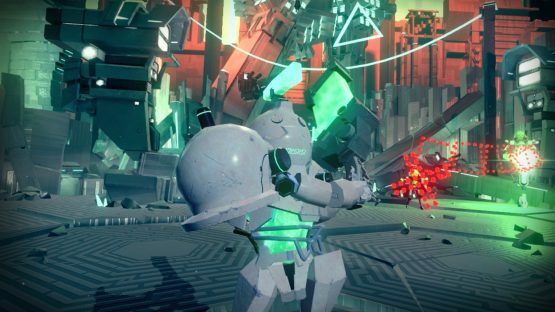 PlayStation VR owners have seen established genres get new twists, and the upcoming Blasters of the Universe brings a new take on bullet hell shooters. I spoke to Josh Manricks, the product lead and technical director at developer Secret Location to learn more about the upcoming virtual reality game. Tyler Treese: The bullet hell genre is one that is quite established, but you get the chance to do something new with it. How did you come up with the idea for Blasters of the Universe? Josh Manricks: Secret Location has always been dedicated to the development of emerging technologies and creating original content. Blasters of the Universe was developed in our innovation lab, by a small team and originated as prototype called Wacky Weapons. We didn’t even have a VR headset with touch controllers and it featured a hotdog launch – yes, really. That was the genesis of the game. From there it evolved into what you see today. Do you feel that virtual reality is an area where developers can really be creative and try new things without having to conform as much to genre norms? VR is probably the most promising sector of games for developers to make something truly creative and new. We’re still in this fledgling state where everyone is experimenting with the absolute basics of game development and redefining how we move around and interact with items and characters. New genres are being created and old genres are being completely overhauled everyday – it’s really quite exhilarating to watch. The potential to innovate in VR is practically endless and it’s only just begun. Consider how far game development has come in just the last 20 years and apply the same logic to VR – you just can’t deny how enticing the future looks, especially with breaking genre norms. What different types of weapons will players be able to unlock? There’s over 130,000 weapon loadout combinations, so you’ll definitely discover there is a ton of freedom in the customization system to really make something to suit your style of play. But don’t get too comfortable with your loadout because each level begs for loadout experimentation to be truly successful at the game. In the Armory, players can test their weapon before they head into battle. As players progress in the game, new weapons unlock. There is a massive variety of weapon mods, ammo and shield options. Arcade titles seem to be a great fit for VR since many players don’t want to spend hours with a headset on. Did that impact the design at all? Blasters of the Universe was definitely designed with shorter play sessions in mind. Our game features intense music, flying colors and relentless projectiles. Add on the potential discomfort of wearing a headset for too long and it’s safe to say it would take quite the mental resolve to play a VR bullet game for hours on end! So, short answer is yes, our decision to make an arcade-style game was absolutely impacted by the players who don’t want to wear headsets for multiple hours. It’s no coincidence most of the successful VR titles follow a similar philosophy. Are there any challenges developing for multiple VR headsets at the same time? Almost everything about developing for VR is at least a little more difficult than anything else because of the current lack of standardized practices. This absolutely includes developing for multiple VR headsets at the same time! However, there are ways to streamline this process using newly developed VR publishing platforms that make it easy to bring content to the major headsets. By the way, that’s totally a shameless plug – Secret Location actually created a VR publishing platform called Vusr! The campaign has a pretty humorous setup, what else can players expect from the story? Blasters of the Universe is a truly modernized take on the classic bullet hell genre. You face an unforgiving onslaught of enemies controlled by Grand Master Alwyn, an insecure man-child who whose outdated insults might make you eye-roll yourself to death. Expect a game that’s surprisingly easy to play, but requires true physical finesse to overcome the tougher challenges. A lot of the best PlayStation VR games are very physical in nature. Does it ever become challenging to playtest a game that has you constantly moving and dodging bullets? Blasters of the Universe can be seriously strenuous on the higher difficulties – I don’t envy our playtesters! The physicality of our game is sort of a disguised blessing as it kept us active during office hours and helped us avoid the stereotypical sedentary office worker lifestyle. What are your thoughts on the current VR landscape in terms of sales? Does it have the market penetration you would’ve predicted? I think it’s completely understandable and clear as to why VR’s mainstream acceptance is happening slower than the analysts predicted. I also think the path ahead of VR is really going to bring the masses in. The new untethered headsets are a major quality of life improvement, out-of-home experiences make it easy for people to try VR, and creators are really starting to release some phenomenal content. If these trends keep up, the market will expand, it just may not happen as quickly as people initially predicted. VR is still in its infancy in many ways. Were there any other VR titles that helped or inspired the game’s development in any way? Secret Location has been working in VR since the Oculus DK1 days and have been recognized with hundreds of accolades for spearheading innovation in Virtual Reality media, becoming the first to win a Primetime Emmy for VR content with our work with FOX. Every experience we work on inspires us to keep moving forward and apply the lessons we learned to make better content. Let our readers know why they should check out Blasters of the Universe when it releases in February! 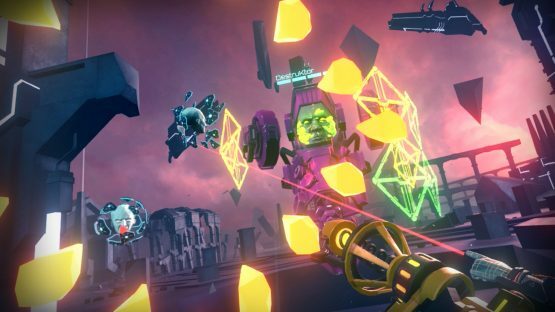 Blasters of the Universe takes the classic bullet hell genre and completely revamps it with mind-bending VR. The whole game is inspired by over-the-top 90s VHS covers, bathed in vibrant neon and spiked by Grand Master Alwyn’s villainous and flat-out ridiculous humor. We tried to make something that’s easy to play, while providing the in-depth challenge bullet hell games are known for – it’s a striking balance that we’re quite proud of and think everyone should give a shot! PlayStation LifeStyle will have more coverage on Blasters of the Universe as it nears its February 27 release date. We’d like to thank Josh and the team at Secret Location for answering our questions.